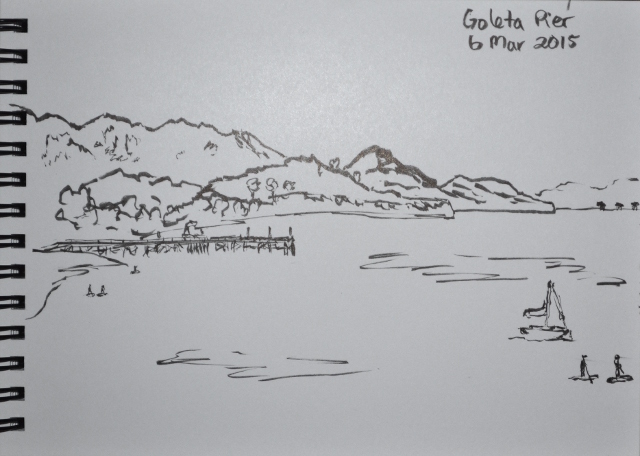 It seems most the outdoor sketches this month came from short around town wanderings. 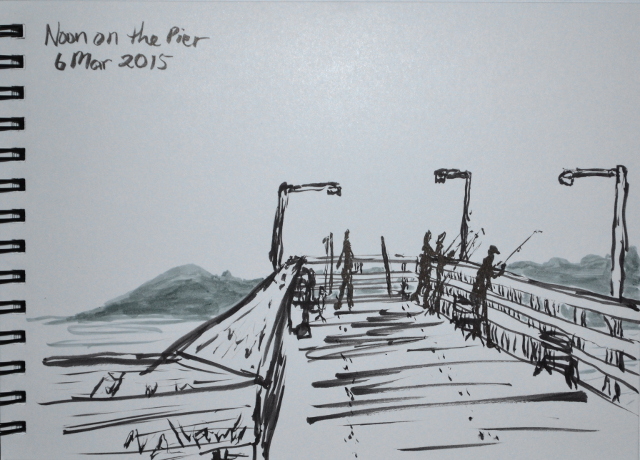 The population at the end of Goleta Pier is outnumbered by the fishing poles. 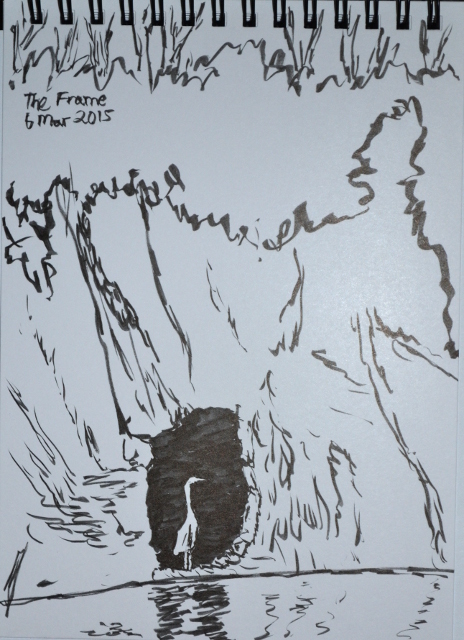 At the far edge of the Goleta Slough, I found a cave and an egret. After a walk along the beach, I found myself with a good view of the pier and some ocean going SUPs. Seeking some cooler air up on Mountain Drive. Looking down over hills and fog and Arroyo Burro Trail from Inspiration Point. More fog, this time from White Ledge Camp. The highway is dotted with state parks like this one tucked away a bit south of it. Many hit it for the beach, we hit it for the peak. There are actually three other peaks as well, and while they are all a bit small, they do start from near sea level, so there is a reasonable climb. We find some parking and, well, get to hiking on the well traveled path. Some rocky shores to the east. The beach goers have only a patch of sand between rocky sections, although a large one. 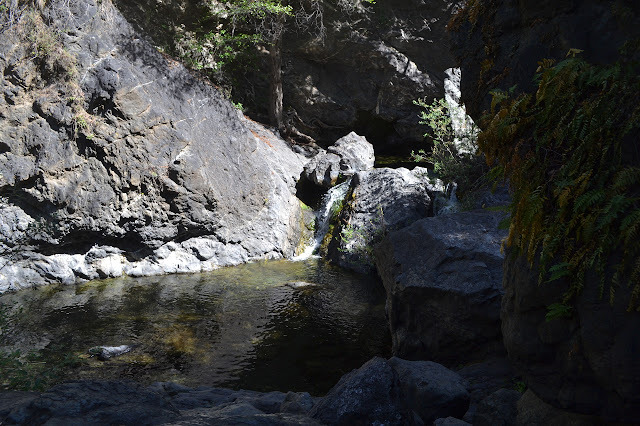 Salmon Creek Trail climbs up to a ridge above, but the first big sight to see is just around the corner. As the trail climbs, a sign points to a spur that goes to a large waterfall. The spur is well traveled and easy to follow at first. Shortly, it starts to split and each route has its own obstacles. We end up on a route by the creek that crosses over on some random metal bars that look like a make-shift draw bridge with a rope to pull it up behind us. An easy rock hop back over places us on a bit of flat in front of the waterfall. 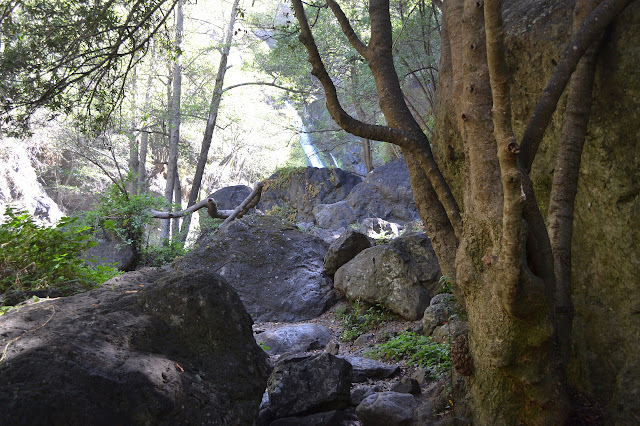 A trail of sorts over boulders to the waterfall, which is already visible in the bright area. 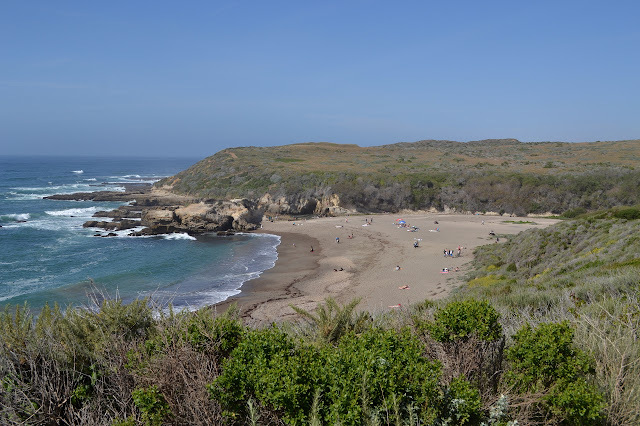 There are getting to be lots of places to see elephant seals on the beaches in the right season, but many are closed except to pass through with a surf board. The official viewing site is atop a short bluff with a fence to keep the people rounded up. It allows surprisingly close up views all the same. We stopped on the way up the road to see them. 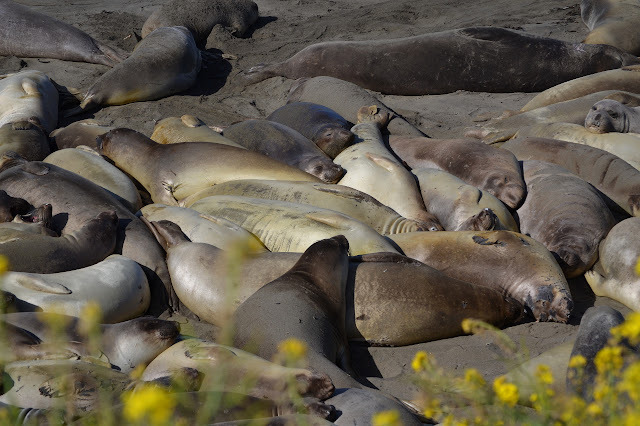 They have thinned out from the peak, but there are still many females and juveniles relaxing under the sun. 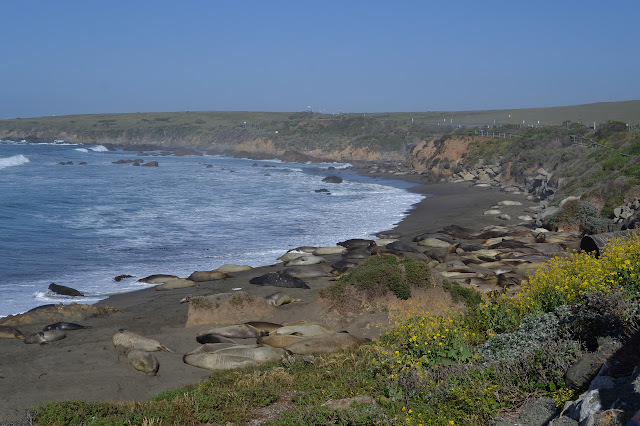 A small bay full of elephant seals beside highway 1. Lots of happy faces. They can still be fairly thick on the beach. The females do not have quite the same schnoz as the males. First, I think I should point out that this hike ended with a law enforcement officer telling me that I could not legally get to the place I was standing. This hike should not be followed unless you have obtained better information from an authoritative source. A few months back, I noticed a line of geocaches on the geocaching map in a place I did not expect to see any extending from 150. With a bit of excitement, I looked at the descriptions to find someone had chatted with the firefighters at the local station and been told it was fine to hike along the fire road. Firefighters are often knowledgeable sources for such things. These were all about 4 years old and the logs all come in the theme of "I had a delightful little hike". No one is trying to be sneaky and no one had any trouble, so I thought I would have a delightful little hike getting to see Lake Casitas and White Ledge and everything else from a different point of view too. 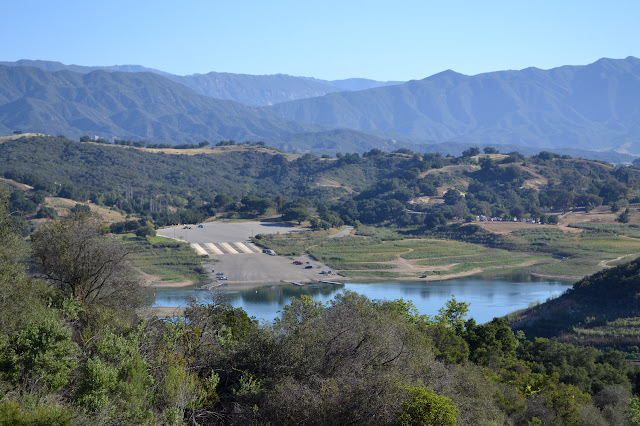 Lake Casitas is so low, the boat launch does not even get near to the water. 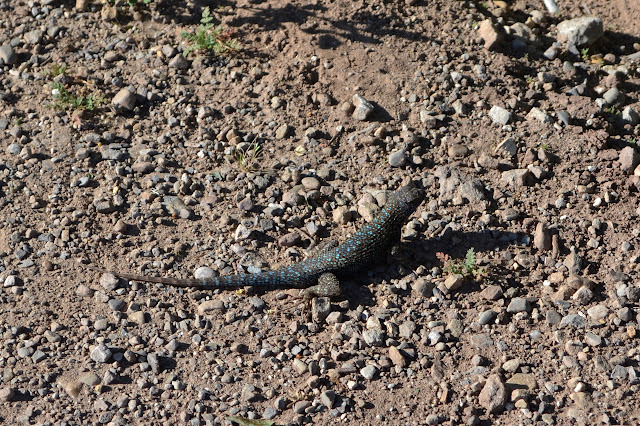 Some local wildlife with beautiful turquoise spots. (Day 2 of 2) It is warm enough now that getting up in the dawn light before the sun is easy. The marine layer that held the coast yesterday has been completely cleared out this morning. The gusty winds overnight probably made that happen. Carpinteria is spread out below as I perch on my dinning room rock having breakfast. Oil derricks spot the ocean and the misty forms of Santa Cruz and Santa Rosa Island rise where there was piled cloud before. The southwesterly view down the canyon beside White Ledge Camp. Grabbing my gear, I set out on the return. Like the return from the end of the trail to the camp site, it is harder to follow the trail in this direction. 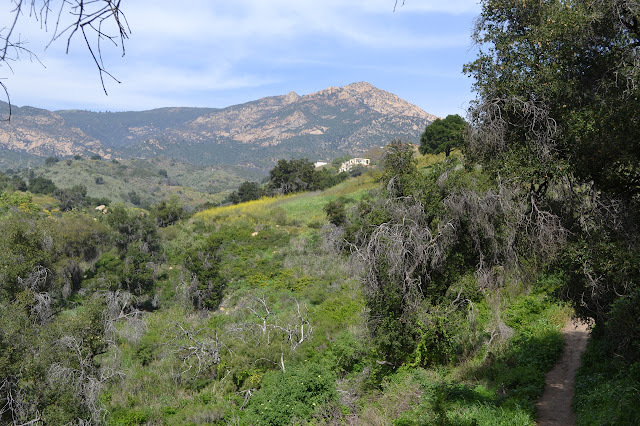 An apparent space in the brush tempts me to a ridge line with no more trail. It does not take long to find the missed turn, but it is disconcerting. My footprints are harder to see after the wind, but still generally give clues as to the correct direction. 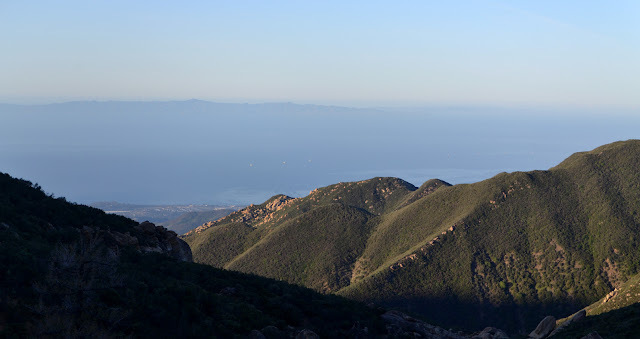 A more southerly canyon shows Casitas Pass and the misty shape of Anacapa Island. 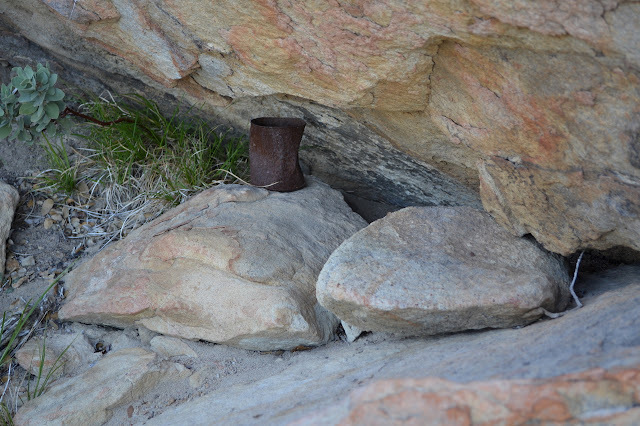 A rusted can left in a rock shelter tells of long gone passers by who did not practice "leave no trace". 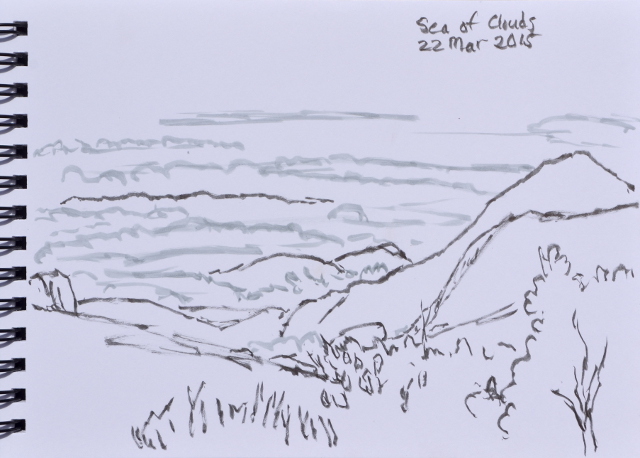 (Day 1 of 2) After going to the end of Camino Cielo to see how far it goes for the second time, I felt that I was rather neglecting the other side of the work on Ocean View Trail. 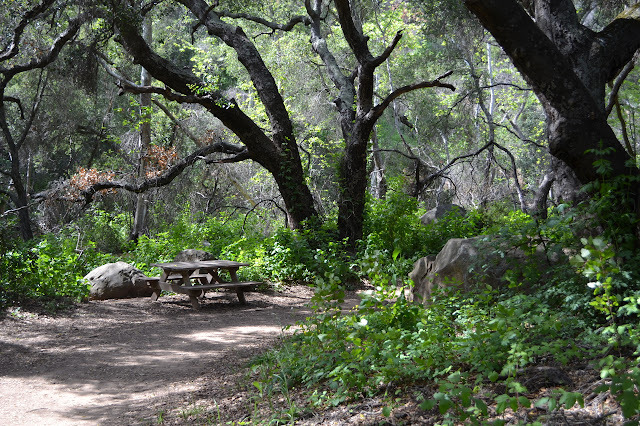 On this side, they have not been hauling up tables for the pleasure of hikers and occasional campers. For the nostalgic, they have gone one better and uncovered an old campsite along the trail. It is identified on the 1938 forest map (and no others, it seems) as White Ledge Camp. 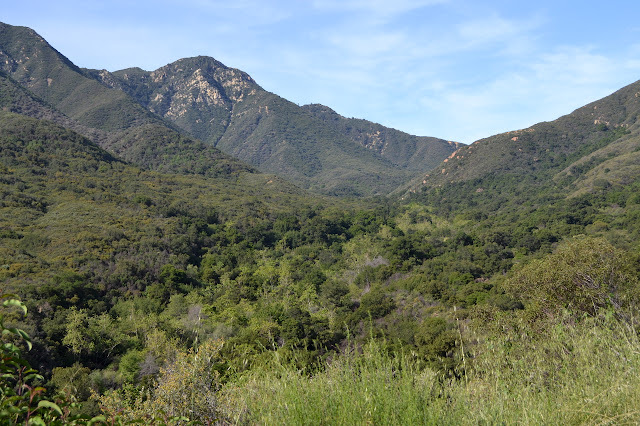 To start, I headed up to the end of Matilija Canyon Road and find a parking spot. 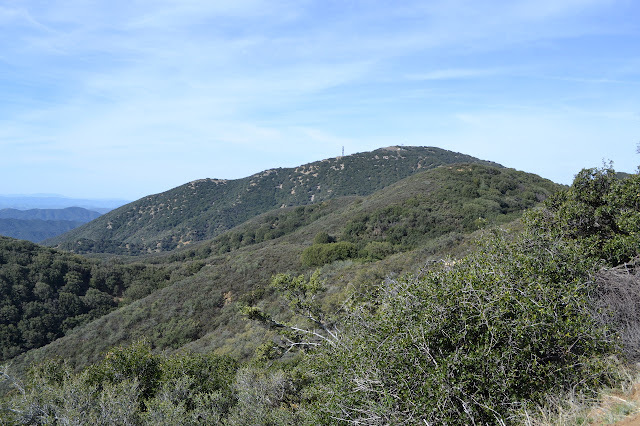 From there, I have to hike up to Murietta Divide and up Monte Arido Trail to the ridge to meet the old Ocean View Trail. 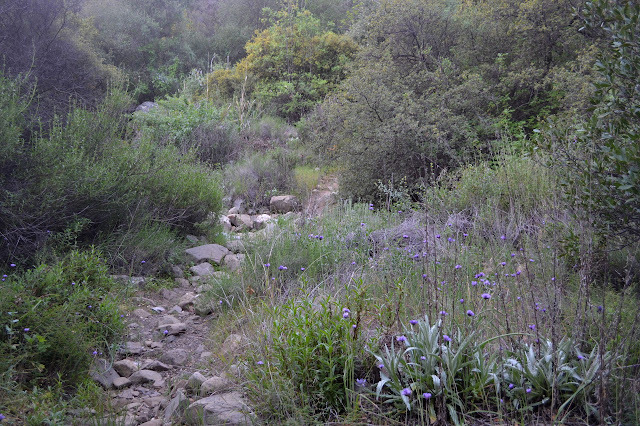 A delightful section of Murietta Canyon without a thick lining of poison oak. Not too far up the trail, there is a shout from a hunter who seems to have a friend and two kids in tow. The kids each have a rifle and some camouflage clothing too warm for the predicted weather. The leader wants to know where the designated boar hunting areas are. The younger boy is really excited about it all, the older girl seems more focused on observing the environment. I can just point out the private property as a no hunting zone since there are no designated areas. They have an idea of going up to a "little pond" they found on Google maps called Jameson. Pointing out that it is a municipal reservoir, not a pond, and some 8 or 11 miles away (give or take) somehow does not lessen their enthusiasm about getting there. We go along the trail since it is a nicer way to go, but I regret directing them this way when it occurs to me to ask if they know what poison oak looks like. "Kinda." They do quite like the little campground, which is empty today. I point out the poison oak and leave them around the campfire ring having jerky to finish the trail portion and climb to the divide. 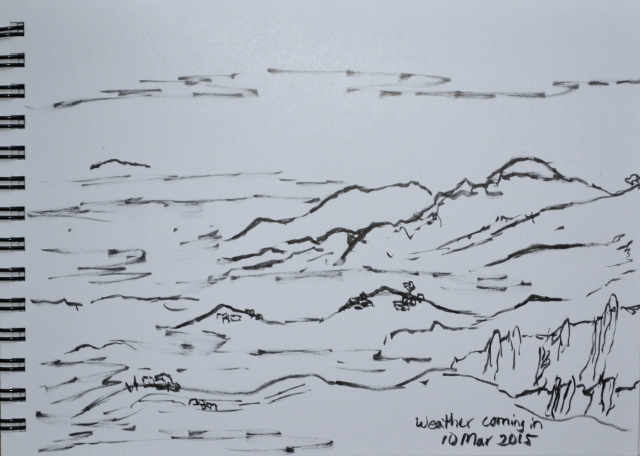 Looking up the canyon toward the high point along the Santa Ynez Mountains. 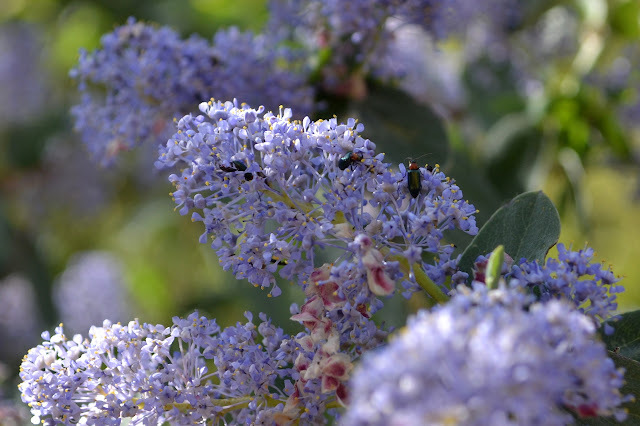 Beetles crawling around the ceanothus flowers. 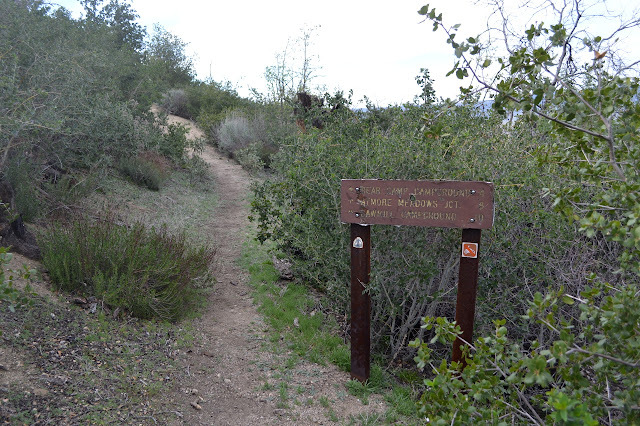 For Pacific Crest Hikers heading south, Horse Camp Canyon is their introduction to Angeles National Forest. Conversely, for the majority heading north, it is the very last gasp. For me, it is an afternoon hike for until I stop and turn, but would be a good way to hike Liebre Mountain with a bit more time. 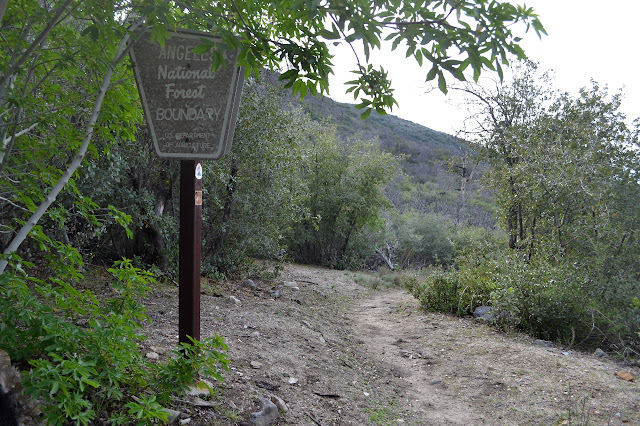 Entering Angeles National Forest on the Pacific Crest Trail. The trail is generally flat and there is only a screen of trees between me and the road at first. This is not so bad as it is a seldom traveled road. The trail is somewhat overgrown, but not difficult to follow. It meets another trailhead just before starting to climb. 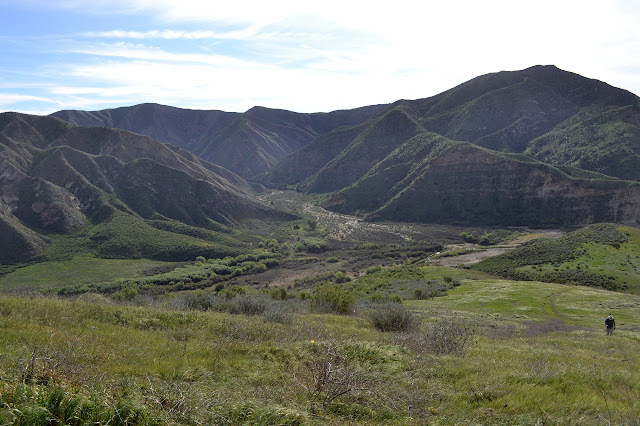 The climb stays generally in a small canyon east of Horse Camp Canyon and quickly gains views over the San Andres rift zone and the valley beyond. It is less often overgrown and sometimes quite wide along here. At the second trailhead, there is a sign with mileages that need at least another 50% added on. Looking northwest over the rift zone. The Powerhouse Fire closure had put to rest any thought of returning to this area again for a while. Initially, it was all the way to I-5 and down to Fish Canyon, then a tiny bit opened, but not Fish Canyon. Recently, much of the area west of Lake Hughes Road was opened. A trail I hiked before is just barely into the open area, but today I am interested in the named feature on the local 7.5' quad: Burnt Peak. It is entirely along road, but there is a locked gate three miles from the top. The road up to the gate is not maintained for passenger cars, but I have found it to be quite passable although often one lane. Burnt Peak, may destination for the moment. The peak does not look like much from the start. The nearby top of Sawmill Mountain appears to be higher than it. The road starts off dropping to a saddle rather than making any attempt to climb. After the saddle, the climb is easy, but continuous. Much of it is shaded, which is nice even if not quite as necessary as yesterday. Views opening up to the Tehachapi Mountains to the north. 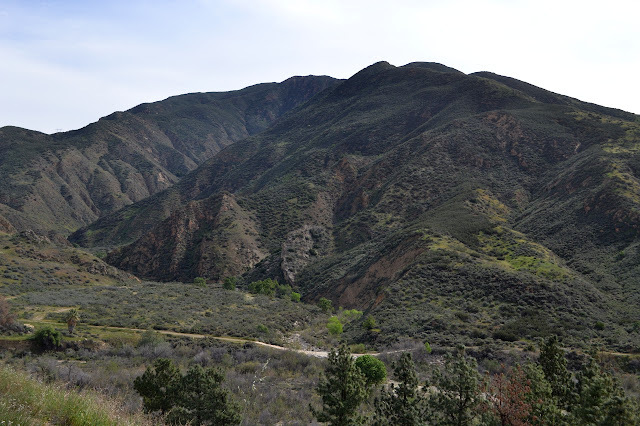 I have been up Fish Canyon and up Cienaga Canyon (north along Castaic Creek), but have not been along the Elderberry Forebay. A road goes down along the edge and to the main body of the lake. First, of course, I have to get down along the paving to the junctions. Today was expected to be hotter than yesterday, but for now a layer of clouds is holding the effect of the sun at bay. 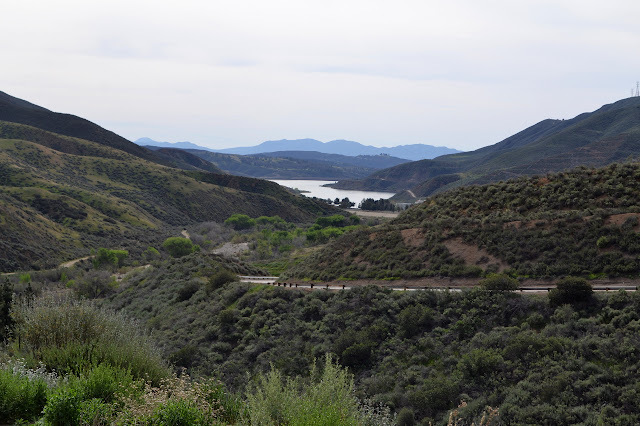 A peek at the closest arm of Castaic Lake. After the trail work on Pothole, I decided to have a quick hike up to the top of Townsend Peak again. It is much cooler along this bit of Canton Canyon, and the later hour helps. I elect not to drive up the 0.4 mile of road before the gate this time. 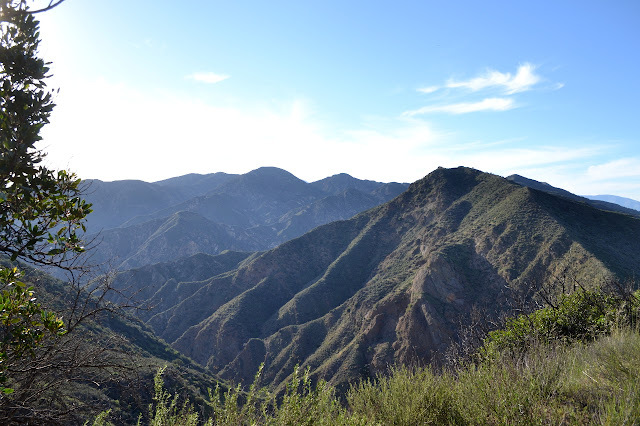 A few miles up Canton Canyon from Lake Piru. It is time once again for another bout of trail work on Pothole and the day promises to be hot. Most of us meet at the fire station, then we pick up a few more who have their own keys at the trailhead. 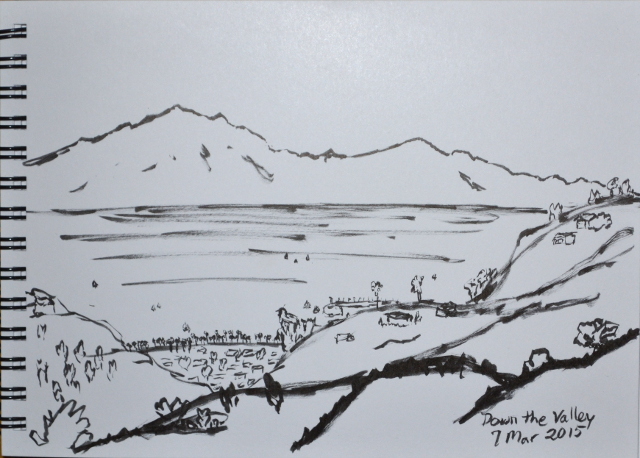 We climb again directly up the hill, ignoring signs pointing at the memory of a trail off to the left or the right. It is still green, but fading to yellow and brown already. Climbing up that hill. Canton Canyon is in the background. Heading up to Inspiration Point can be a bit of a zoo from Tunnel Trail or a longer walk with frequent, but not constant, meeting of other hikers from the water filtration plant. I prefer this second route. 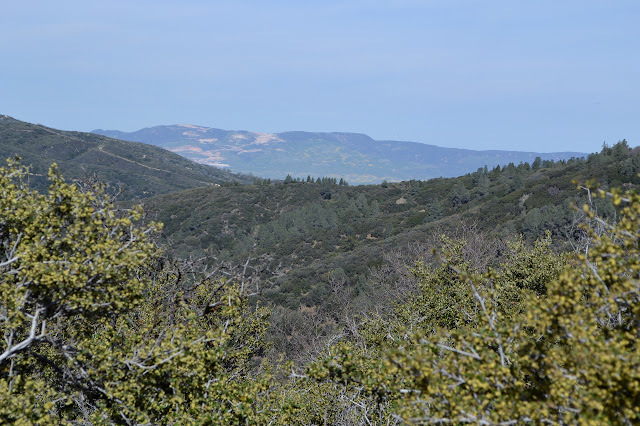 It is a frequent enough hike for the Wednesday conditioning hike the local Sierra Club chapter does, but it has been a while since I have done it in the light. Cathedral Peak as I start. 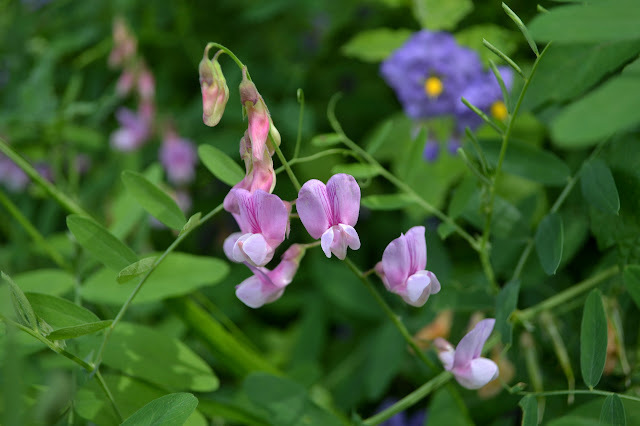 Some pink sweet peas and Douglas nightshade blooming. The poison oak is lush this year. The creek is still flowing, as are a few small tributaries. It is nice to hear the water. I hear the bees buzzing, too, and quickly locate a bee hive in an oak about a yard from the trail. It is good to hear the bees, too. The picnic table still sits under the trees. Just about all the green surrounding is poison oak. 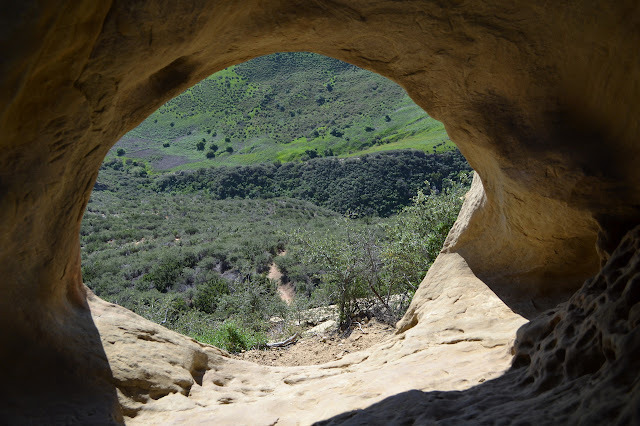 The local chapter of the Sierra Club was offering a hike to the Gaviota Wind Caves, but with a twist. They were planning to hit some extra caves on a cross country route. I decided to go. 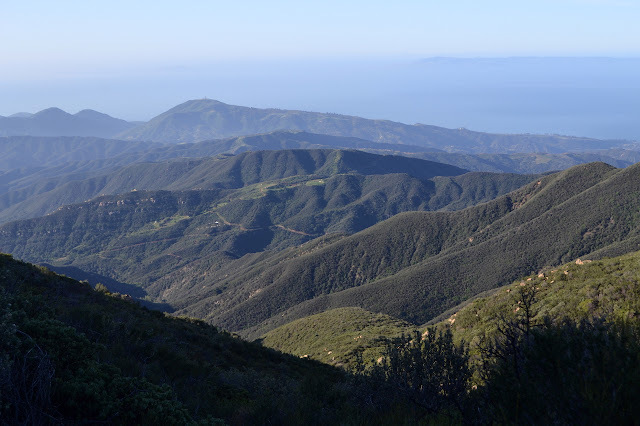 We total five hikers as we arrive in Gaviota to find it cooler than expected. A light breeze makes the day even more comfortable for a little walking. We start off heading up the Beach to Backcountry trail to the wind caves along it. Robert, who is leading, says this is the opposite direction from how he usually does it. Most of the rest of us agree that it will be doubly new to us this way, since we have not done it. Dark spots in the rock mark the wind caves that will be seeing at least a hundred visitors today. We stop at the viewpoint at the top of the hill to look over the ridge on the far side. It is pock marked with the caves we will be visiting later. I cannot see much trail around them, but there is a spot below them with a well established tread. We turn back and start climbing again over the natural concrete. We take a moment at the first cave, the only one actually along the trail, and then start climbing again as the trail starts braiding. We end up on the wrong one that passes by close under the front caves before purposely taking the wrong one up to the top. Look across the canyon at the top of the hill to find more wind caves. Peeking out to the trail below from the window cave at the top. 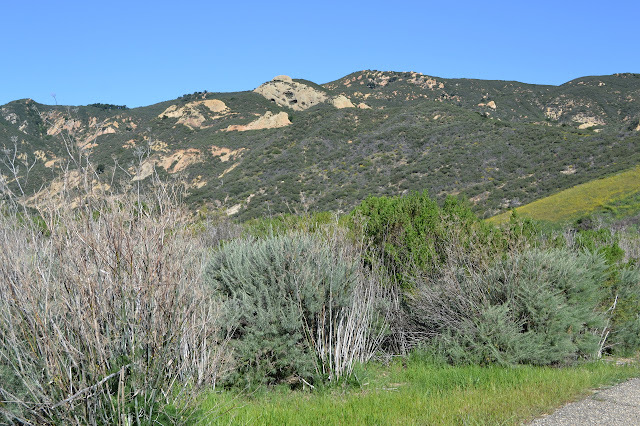 The county has some nice open spaces and parks, but the San Marcos Foothills Preserve may well be the most beautiful of them all. It sits among grassy hills studded with oak and pepper trees with views of the mountains and the ocean. We pass a small encampment of painters, two pointed at the land and one pointed at the sea, just before coming to the preserve parking. Light breezes and warm sunshine give no memory of yesterday's rain, but a few muddy spots do. 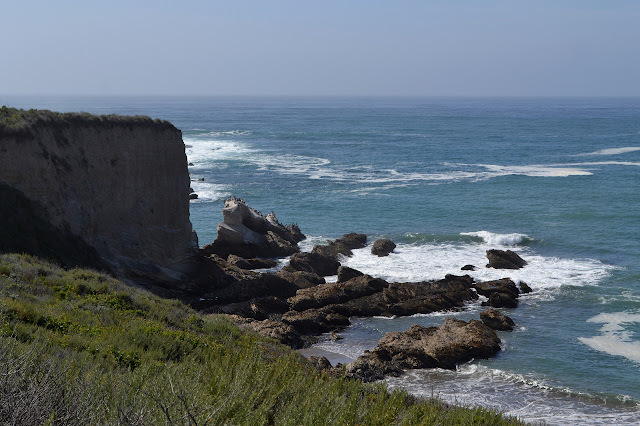 Some of the ocean views before even starting off into the preserve. 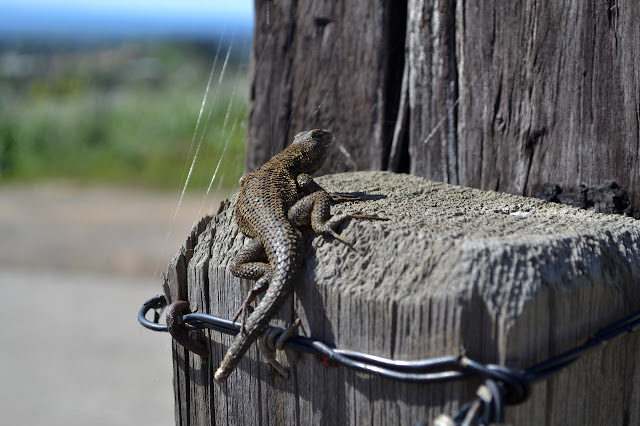 A lizard sits on a fence at the end of the road.